Reorganising the Twynham School campus to accommodate a temporary infant school for 90 pupils. In order to meet increased demand for primary pupil places, Twynham Primary School is planned. Several potential sites were looked at but only one was deemed suitable. Detailed land purchase negotiations means the new primary school build will not commence until 2017. Because there are currently too many pupils to fit into the existing infant school, a temporary infant school to accommodate 90 pupils and nine staff was created on the existing Twynham School on campus. 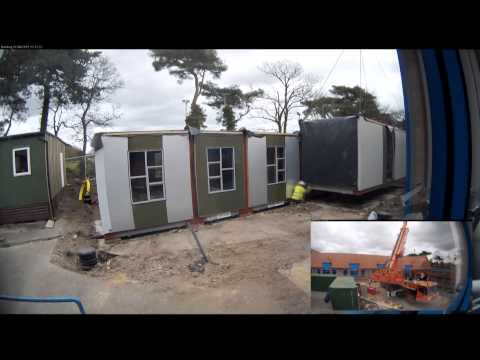 The temporary infant school is being fitted into a group of existing modular buildings. The students and staff displaced from these buildings are being relocated to existing spaces across the campus. Because of the number of students involved and the limited and complex locations of the spare spaces, a new two-storey modular block containing six classrooms was built on the campus. This was in a tight location while the school carried on its day-to-day timetable. The units were manufactured off-site, delivered on lorries, lifted off and into position by crane then bolted together. Internal and external finishes were then applied and connections made to existing campus building services and IT systems. Building work started on site during the February 2015 half term and was completed 16 weeks later in early June 2015, on time and on-budget, to a high quality with minimum disruption to the school. View a time-lapse video of the construction via Youtube.